Office hours are essential if you need to tell your customers when you're available and when you're not. 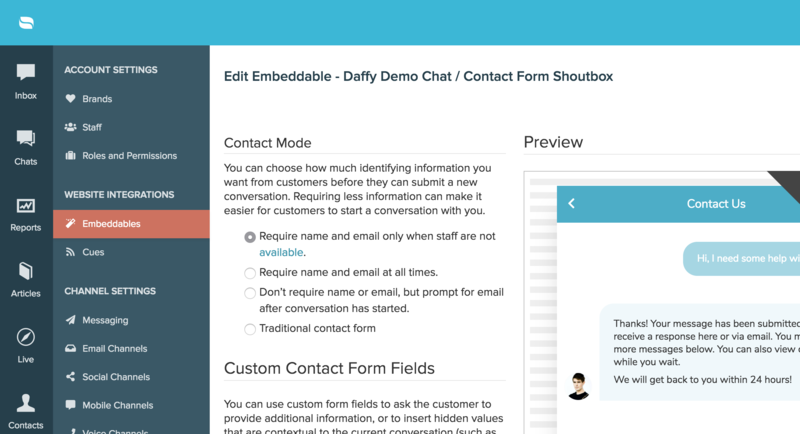 For Shoutboxes and Lightboxes that utilize Real Time Messaging, not only can you set expectations for when you're get back to customers but also when you're in office and when you're out of office. You can easily add office hours and blackout dates for your brand and business by going to "Settings" and then "Messaging". 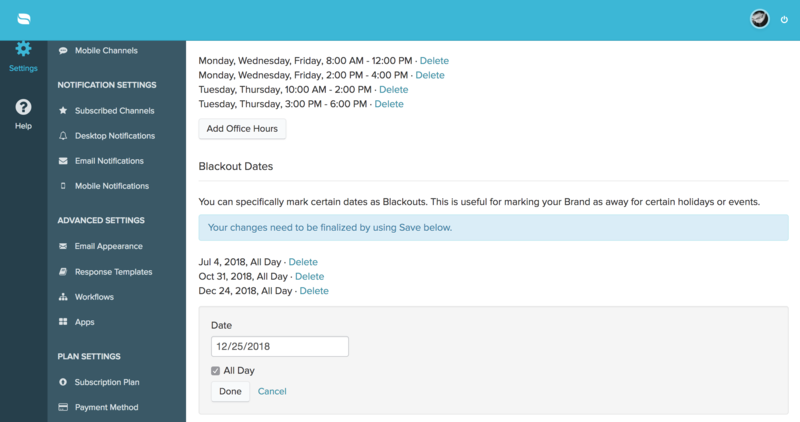 When you fall out of the set office hours or a blackout date is triggered, Re:amaze will display a snooze icon on your Shoutbox and Lightbox indicating that you're currently unavailable. A time or date will be displayed for when you and your team will be back. Office hours in Re:amaze can be added as individual blocks throughout the day and blackout dates can be added as individual days throughout the year to correspond with national holidays. Blackout dates can be further broken down by hours in the day as well if needed. 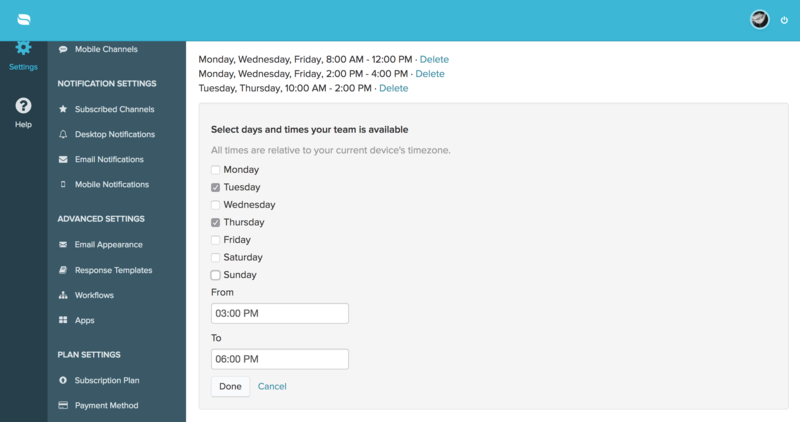 If Classic Live Chat is already enabled, individual team members can set their own availability hours, which overrides your Office Hours. When your team is not available to serve Classic Live Chat requests, new conversations automatically fall back to Real Time Messaging with regular Office Hours. In summary, individual staff hours for Classic Live Chat take precedence over your Brand's Office Hours, but when Classic Live Chat is off or disabled, Re:amaze falls back to Real Time Messaging and your brand's Office Hours are enabled. 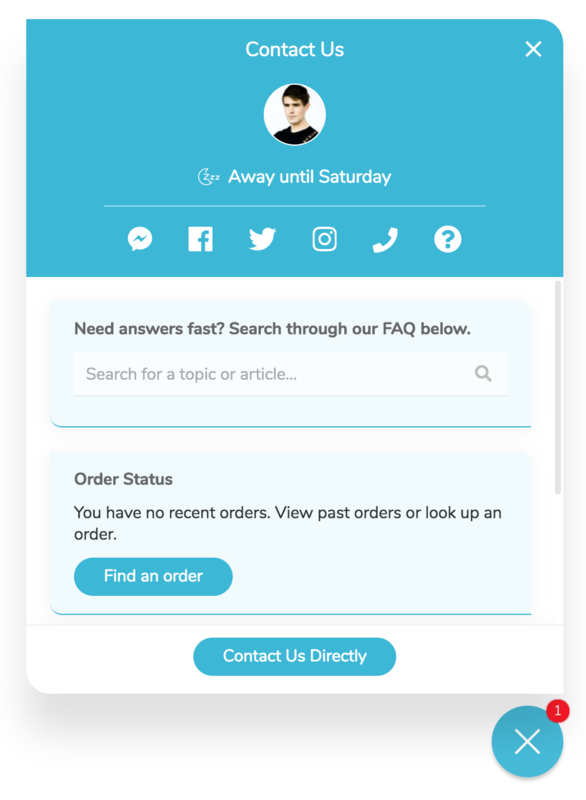 When you're using Real Time Messaging and would like to ask customers for their name and email ONLY when you're outside of your Office Hours, you can pick the specific contact mode that supports this. Keep in mind that this only applies when Classic Live Chat is turned off. Office Hours do affect your staff reports' response time calculations. You can read about it in our article about how response times are calculated here. Essentially, if you have office hours enabled, the response times in your staff reports only reflect response times for when the staff is working. Email autoresponders can be set up to automatically reply to customers based on certain times of the day. If you'd like your autoresponder to send when you're not inside of office hours, you have the option of picking the "Follow Office Hours".